New 2019 Nissan Altima 2.5 S FWD with automatic CVT transmission (STOCK# NW60250, VIN 1N4BL4BV9KC209311) $139 per month lease for 36 months. $3100 cash/trade down + $139 first payment + $220 doc & title prep + $595 bank acq fee + $0 security deposit = $4054 total due at delivery. Sales tax, title and registration fees additional. Includes $1400 NMAC lease cash. 12,000 miles/year. Lease sale price = $23,849. Lease end buy option = $13,733. MSRP $25,210. All incentives to dealer, cannot be combined with other offers. Available to well-qualified buyers with Top Tier credit, not all will qualify. Offer ends 4/30/2019. The Nissan Altima boasts sporty styling, a comfortable interior, as well as a variety of built-in applications to keep you connected. With multiple trim levels to choose from, the hardest part will be deciding which one is right for you. 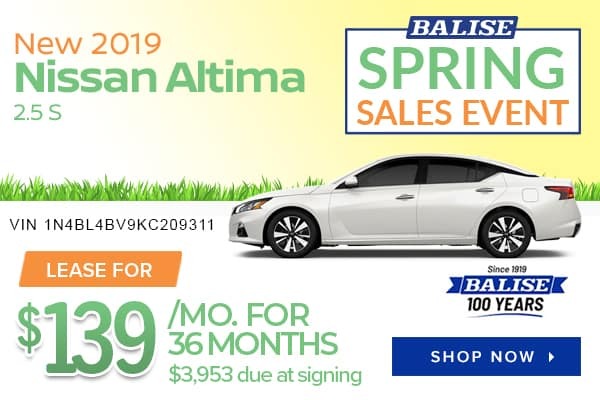 Make your way down to Balise Nissan of Warwick today and discover why so many people from Providence, Cranston, and Pawtucket are choosing the Nissan Altima for their daily commute. When you see a Nissan Altima near Coventry or North Attleborough, you can’t help but notice its stunning good looks. The familiar shape of the Altima keep the overall design in balance, so you don’t have to worry that your sedan will look outdated. Inside of this sedan, you’ll be welcomed with a comfortable and spacious interior. Advanced Drive-Assist® Display is a system that has been crafted to help minimize time looking away. The bright 4.3-inch LCD screen is centered in the instrument cluster and shows call interactions as well as service warnings. On the safety side, the Automatic Emergency Braking system will brake if you fail to respond to help avoid a collision. The Nissan Altima also comes equipped with Intelligent Forward Collision Warning and a RearView Monitor. Not surprisingly, the Nissan Altima is extremely popular. That’s why we keep our Nissan Altima inventory stocked. Take this time to browse our online inventory for the model that’s right for you. Then, let our specialists show you the details and take you for a test drive. 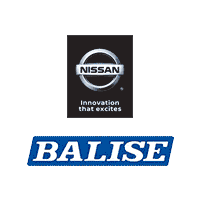 We know you’ll fall in love with the Nissan Altima and Balise Nissan of Warwick. See us today!